Thank you for visiting. The following posts represent my artistic journey; journaling my paintings for all to review. Each painting is available for sale For payment information and shipping contact me directly artistmlh@yahoo.com. Thank you and enjoy the site! I Love how the brown outer shell contrasts softly with the creamy white interior of the shell. February is the month of LOVE and FLOWERS. These will never wilt or fade and will last as long as your love will. Congratulations! Your painting, "Flowers and Figs Still Life", was selected as part of the FAV15% (jury's favorite 15% of the entries) in the December 2018 BoldBrush Painting competition. This honor means that you might be featured in http://informedcollector.com in the coming months. Thanks again and congrats again! (plein air paint) the rising sun. One more time I drove down to Edisto Island to paint the glorious sky but this time it was to paint the setting sun. The colors were simply sublime! Wedding Event Paintings - Love is in the Air! It is always Wedding Season! This is a beautiful wedding (unfinished, but well on its way) which took place at a very exclusive property on the Ashley River called Runnymead. Neighboring the historical plantations and gardens up and down the Ashley River in West Ashley SC, this site boasts historical ruins of its own with river views and grand oaks that can shade up to an acre of land! This is a stunning location for a wedding. Another beautiful location to capture a wedding on canvas, and this one is truly exclusive; is the back yard of the Groom's parents home! This stunning location also has river views behind which the sun sets in glorious technicolor!! I just love my job!! I needed a model to pose for me. . . Richard willingly sat and did so very well. "First Love After All These Years"
An Anniversary Gift of two lovely people who found each other through thick and thin and are still, after all, still very much in love. "Portrait of Richard "Moses" Cook"
'I was fortunate to paint this directly from life on site on the streets of Charleston SC of a lovely man who once lived on the streets of the city but has now found a home of his own. He acquired the nickname, "Moses," because he led his homeless friends out of the the "tent city" to a land (home) of their own. A group of 175+ Artists, led by Artists extraordinaire, Larry Moore, Lisa Hale, Cathleen Windham and Denise Rose are donating an original work to raise emergency funds for clean up and rebuilding the areas most in need along the panhandle coast. Many of the artists donating have stood and painted in the spots decimated by the storm. The monies raised will go to Franklin's Promise Coalition to address immediate needs there: clean up, food, shelter, water, and emergency crews to do the work. Joe Taylor, from Plein Air South and The Forgotten Coast Plein Air Event, is on the ground clearing debris and helping along with the good folks of the Forgotten Coast area. live Sunday October 21st at 7pm, 100% of the profits will go directly to the cause. with whom I am showcasing art for an upcoming Art Show Friday November 2, 2018.
as well as what we paint that makes us unique. Painted as part of an upcoming Show with Artist Madeline Dukes, who is well known for her beautiful abstracted and realistic floral paintings. We are calling our show, "In Common" where we will showcase our in common styles as well as the types of paintings that compliment and make us unique. I added, for the sake of the story, the plank of wood that the children who grew up playing in this tree would use to climb up this enormous Oak Tree. Often I'm asked to paint a painting from a favorite photograph. Painted on location near the point on Edisto Beach SC just after the sun topped the horizon. At this point, looking directly into the rising sun was becoming difficult, so I decided to change my direction 180 degrees toward how the rising sun was affecting the surrounding beach, surf and the sand's color. It was glorious. what ever happened to Summer?! The best part of summer is memories we create together with family and friends. This series hopes to capture on canvas those lovely memories that help us hold on to the precious and fleeting times we share with those we love. Something magical occurs in the sky's color when a storm cloud moves in during the time of the setting sun and I just happened to be in the right place at the right time to enjoy it! This all happened when my family and I were gathering on the beach in anticipation of the Fourth of July Fireworks and celebrate our county's birthday. The sky put on its own pre-show: a Spectacular Celebration! Some of the cutest sights I get to witness when I visit the beach are the children who find themselves enjoying a whole new world at the beach. Almost every time without exception the little boys wear or play with toys that are blue (see "Beach Baby in Blue series") and the little girls wear or play with something that is pink! So I've started a series for each and here is the latest. Sweet childhood memories of times at the beach while family vacations . . . capturing these blissful moments is my hope. Volumes can be spoken in a moment like this. "Still Life Demonstration (Farmer's Market Finds)"
While I participated in the Cashiers Plein Air Festival this July I was asked to give a demonstration for ticket holders and patrons of the community. My still life was purchased from the local Farmer's Market a few yards away from the Village Green Commons where I gave the demonstration. whose family owned this farm and this tree. She requested that I include the plank of wood that the children used to climb up into the tree and remembers the trepidation she had traversing it way up over the marsh below. her father would allow them a break to play and be shaded in these branches. water to be refreshed until work had to resume. In the evenings, after the hard work was ended, the 9 children would climb back into the arms of this tree to watch the last display of color and light as the sun dipped below the horizon. This was my latest demonstration at the Hagan Fine Art Gallery & Studio of my family's visit to Kiawah Beach just before a strong storm rolled in. . . we were able to enjoy the beach sunshine for at least an hour before we had to pack things up and head for the car. My husband blessed me with an enchanting night out for my birthday and to also celebrate our Wedding Anniversary at the Charleston Grill where you may dine while being serenaded by a most talented group of musicians. My youngest sister is a fan of Billy Holiday (a portrait of her hangs behind the bassist) and I wanted to snap an image to show her. The image became this painting's inspiration! While hosting family, we walked around downtown Charleston, SC; we entered the Circular Church's graveyard as the spring blossoms decorated the yard. . . I looked up toward the beautiful, clear, blue sky and saw this magnificent sight! Now you see it as a painting! 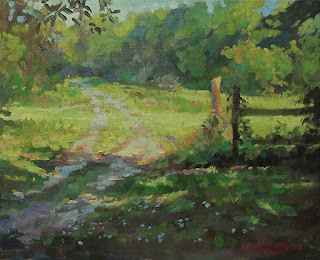 "A Path to the Sea"
Painting with beloved plein air friends, we chose this spot at the end of a street which dead-ends into the edge of Charleston harbor. There is always a path to the sea. 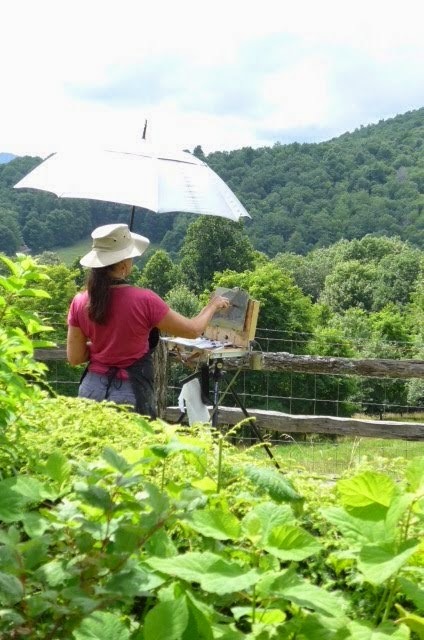 A lovely artist friend of mine invited me to paint at her Rockville SC home which is filled with charm and beauty at every turn. We set up this still life early in the morning on her front porch and got straight to work. . . the golden morning sun was rising and glowing . . . this is one of the results. The light filtered through the trees onto the steps of this historic and beautiful building always attracts me to paint. This was done this spring as you can see the bright red Japanese Maple glowing around the corner of the building. Painted on location in the Old Village at the end of Center Street which dead-ends into the edge of Charleston Harbor. The views are breathtaking!